Item Description: This is corporate surplus in great physical and working condition. Input: 120-230vac 50-60hz 12a-10a Self indicates for use with hp laserjet products only. 1 standard D style computer power cord input, uses 3 reverse D connections for the outputs. 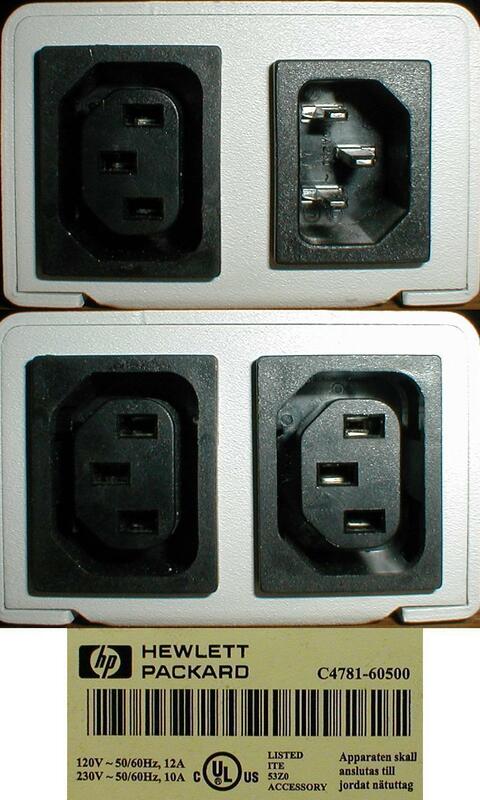 (no cords included) Manufactured by: HP, models c4781-80104 and c4781-60500 and similar. web research: used with the following HP printers, copiers and mopiers and misc paper tray assemblies. Laserjet 4050 Color LaserJet 8500 C3983A Color LaserJet 8500N C3984A Color LaserJet 8500DN C3985A LaserJet 8000 C4085A, C4085AR LaserJet 8000N C4086A, C4086AR LaserJet 8000DN C4087A, C4087AR LaserJet 8100 C4214A, C4214AR LaserJet 8100N C4215A, C4215AR LaserJet 8100DN C4216A, C4216AR Mopier 320 C4229A, C4230A, C4230AR, C4246A, C4246AR LaserJet 8150 C4265A, C4265AR LaserJet 8150N C4266A, C4266AR LaserJet 8150DN C4267A, C4267AR LaserJet 8150MFP C4268A LaserJet 8150HN C4269A Paper Tray C4780A, C4780AR, C4781A, C4781AR Color LaserJet 8550 C7096A, C7096AR, C7097A, C7097AR, C7098A, C7098AR, C7099A, C7099AR Color LaserJet 8550 MFP C7834A, C7834AR, C7837A, C7837AR, C7839A, C7839AR LaserJet 8150 C9135A, C9135AR Color LaserJet 8500N Printer Plus C9737A Color LaserJet 8500DN Printer Plus C9738A Color LaserJet 8500GN Printer Plus C9739A Use: allows you to plug your printer accessories like paper trays and sorters into one common unit. - - -Unit covered under my RETURN POLICY.- - - Are you looking for other hard to find items? Check out my Store! Concerning my packaging: I Recycle. The appearance of recycled material should not reflect on it's ability to resist damage. Shipping for this item will be Calculated based on Zip Code for CONTINENTAL U.S. Overseas: International rates will apply. As usual, multiple items are combined to save on handling fees; 5 Or more items triggers additional shipping discounts! For this item, I ask 50 per added item instead of most others full handling! General Notes And Other Considerations: Thanks for looking! Please see my other Items. Don't see it? Please Ask! I subscribe to the Five Star Service Guarantee. Let ChippiesAvalanche be your source for Recycled, Refurbished and Reused Electronic and Computer items. ChippiesAvalanche has over 35 years experience with Electronics, computers and thier peripherals. with over 146 tons of computer equipment recycled, diverted from landfills. Add to that, over 4500 sales . Please remember to check out our store! ChippiesAvalanche IS a green company. ChippiesAvalanche - Closing the Recycling loop. You too can help save our planet by buying from and supporting a company like ChippiesAvalanche. Thank You, for looking.